We are delighted to ship anywhere in the United States for a flat rate of $5.00! We have saved almost every shipping peanut, box, and piece of bubble wrap since we opened our doors so that we could reuse them to ship to you. At this time we are shipping via the United States Post Office. 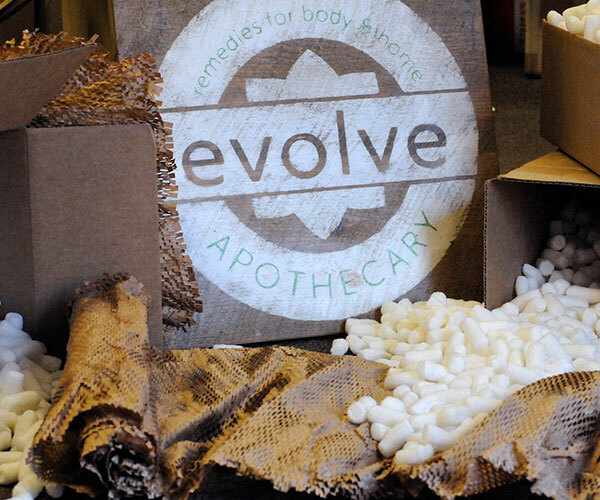 If you need an overnight delivery, or need shipping outside of the United States give us a call at 401-383-3089, or send us an email at sales@evolveapothecary.com. Our goal is that you fall madly in love with any item you purchase or receive as a gift. We will happily refund the full amount paid, less shipping and discounts, if a product is returned to us unopened, unused and sealed within 30 days. We will also process a refund if you have received an item erroneously, or it was damaged on arrival, in that case we will pay for the return shipping as well. All returns should be sent to Evolve Apothecary, 769A Hope St. Providence, RI 02906.